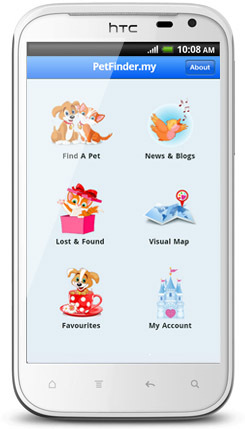 PetFinder.my has officially launched its Android App, due to widespread requests from animal lovers! Tell all your Android friends about it now, and get started helping animals wherever you go! well done! im gonna try it now. Already downloaded! It look exactly the same on my HTC XL, just like the one you posted above. ops i posted on the wrong thread, that was for iphone. on android i can't upload pics and message on pet profiles. i have 3 androids at home. all same result. so i dont think its just me.right right? Hi Jouhari, are you referring to accessing our full website from your Android devices? Our Android/iPhone apps do not t have any function to upload photos - those membership features require you to go to our full-fledged website. Mobile browsers may not support image uploading - the same goes for iPhone/iPad. Hi Jouhari, yes that's certainly what we wish too. Unfortunately with our current limited resources, we can only focus on the core functions that can be utilized by all animal lovers. But we are definitely working towards those features! I like the platform since last time I downloaded it. Suggests to have a chat or Forum so I don't have to grab my lappy or go to the direct website. Overall it works fine and I like the whole concept especially it has no 'for sale' category. Suggests also to have a directory of Pet clinics in Malaysia. More power and please keep it coming!